I’m having another go at catching up with all the books that have sat on my shelves for years waiting to be read. 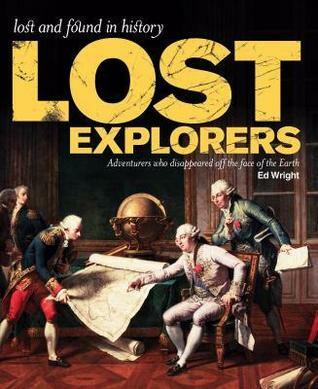 The one I finished yesterday is by Australian Ed Wright entitled Lost Explorers. A beautifully illustrated book which I found is more one to dip into than read cover to cover. It’s basically an elaborate list (and who doesn’t like lists?). It has eighty short chapters each giving a brief biography of an explorer who set off over the beckoning horizon but failed to come back. Mr Wright classifies the lostness under three headings. Those lost without a trace have simply vanished: the reasons can be guessed but not known for certain. Lives lost and legends born deals with cases where the cause of death is known and has given rise to popular reports. Finally lost and found too late looks at all those sad cases where the cause of death was resolved but too late to do anything about it. Although concentrating on the deaths of its subjects, the book also looks at some of the social and psychological reasons for them. Ignorance, of course, plays a large part. New diseases they didn’t know how to treat, wild animals they’d not seen before, or unexpected weather, all took their toll. But the motivations of the explorers also played their part. Men (or women) driven by a desire for gold are not going to turn back when it’s sensible, and the egotistical are not likely to listen to advice. ‘Pigheadedness’, ‘greed’ and ‘false hope’ could be written on many death certificates as Cause of Death. Most of the people written about are westerners, but being lost in exploration is not confined to the west and there are some interesting chapters on Chinese and Muslim explorers. All Mr Wright’s subjects are from literate societies. How many others met similarly silly or poignant fates, who were not recorded? I am sure the original explorations of the Pacific, the peopling of Australia, or the discovery of the Americas were not without their losses.